BEL Notification is out. 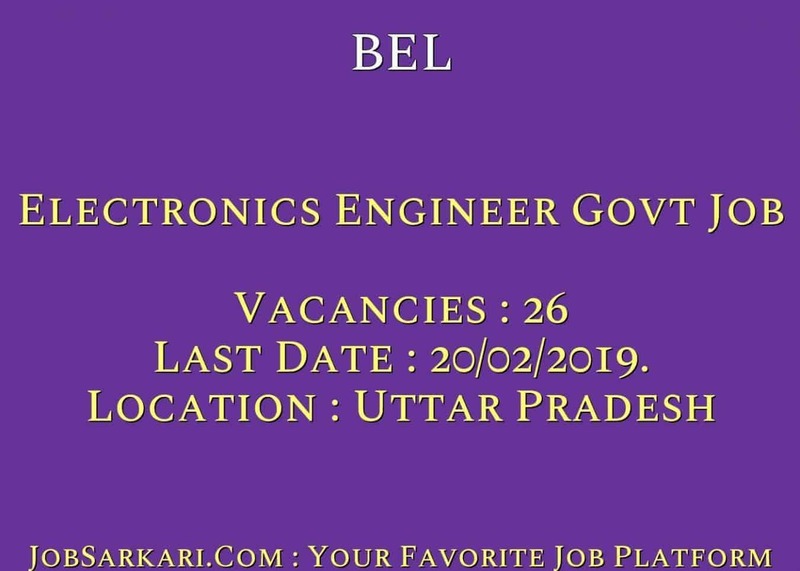 BEL is recruiting for 26 Electronics Engineer Govt Job Posts. You can check BEL - Bharat Electronics Limited last date, download BEL notification, visit BEL official website and check other BEL Vacancy details.Complete Vacancy and recruitment Details about 26 Electronics Engineer Govt Job vacancies in BEL are provided below by JobSarkari.Com only for you. Last Date for Receipt of Application 20/02/2019. Electronics Engineer Candidate Must Have Passed 1st Class BE / B.Tech in Electronics/ Electronics & Communication/Communication Engineering/ Electronics & Telecommunication/ Telecom Engineering. 26. Age Relaxation. 3 Years For OBC And 5 Years SC/ST And 10 Years For PWD. 4. Candidate Have to Go with Their Application Form to the Address Given Below. Bharat Electronics Limited Site – IV, Sahibabad Industrial Area Opp. Vaishali Metro Station Ghaziabad – 201010 (UP) On or Before 20th February 2019. Q. What is the Last Date For BEL Electronics Engineer Govt Job Vacancy ? A. 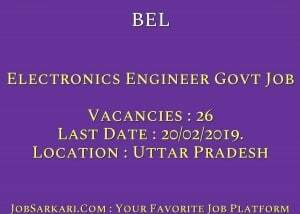 Last Date for BEL Electronics Engineer Govt Job Posts is 20/02/2019..
Q. What is the Form Type of BEL Electronics Engineer Govt Job Recruitment ? A. The Form Type for BEL Electronics Engineer Govt Job Posts is Offline. Q. How many vacancies are available in Bharat Electronics Limited Electronics Engineer Govt Job Posts ? A. There are about 26 Vacancies in Bharat Electronics Limited Electronics Engineer Govt Job Posts. Q. What is the Full Form of BEL ? A. Full Form of BEL is Bharat Electronics Limited .